Starlight is a real estate brokerage based in Abu Dhabi, U.A.E with specialization in Luxury Real Estate. The company has the mission of becoming the biggest real estate firm in the Middle East. The company was founded in 2006 and has made a significant contribution towards the property market in Abu Dhabi. Starlight Real Estate uses established, unique expert methods focusing on the advertising, listing and vending of old and new luxury homes, housing communities, condos, commercial and investment prospects. The challenge for our company was that we wanted to provide a timely 24/7 live chat solution for our clients all around the world. Our customers are spending heaps of money and making a life changing decision. We wanted to provide them with immediate answers to any of their queries. Our sales agents are always on the move and have to be in touch with the customers all the time. We wanted a feature for our agents could send all sort of documentation and brochures to our client’s right from the mobile or smartphone devices. Moreover, we wanted the look of our live chat service to complement our brand and color scheme. We hired Chat Outsource for this challenge, and they were spot on with their chat solution. We implemented Chat Outsource’s live chat support on our real estate website with the aim to empower both purchaser and sellers to discover answers fast by communicating with them in real-time. Chat Outsource came up with a solution where our agents can now access live chat while they are on the go and without the needs to be physically present at the office to communicate with the web customers. They also added file sharing feature to our chat window for our agents to share information such as documents and real estate brochure right from the device they are using. Chat Outsource customized our chat window with our brand color scheme, and it fits perfectly with the look of our web page. Chat Outsource has given us an engaging website enabling immediate communication with our client base. Since hiring Chat Outsource as our live chat solution, our conversion has also increased by 40%. 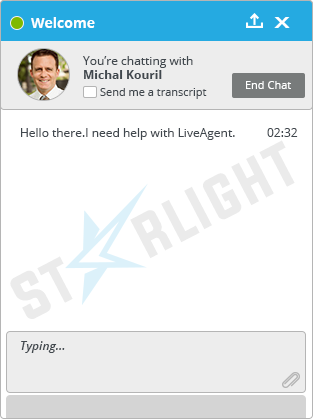 As you can see a tailor made chat window for StarLight, matching their official brand logo and color scheme. 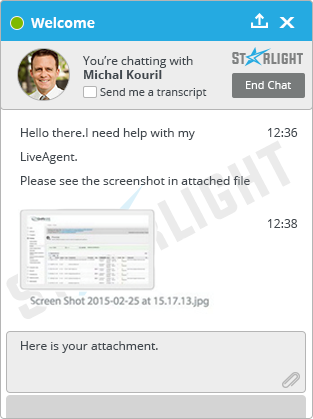 As can be seen from the picture we provided Starlight with the ability to attach and sent documents through live chat support window. Chat Outsource has surpassed our expectations. Really admire how customizable their live chat support is. Our sales have increased, and we are doing more business than ever before. Chat Outsource has played a big part in our success.